In cooperation with Airbus, Norwegian shipping company Wilhelmsen (WSS) launched this week a shore-to-ship Singapore pilot project, marking the first deployment of drone technology in real-time port conditions, delivering a variety of items to working vessels at anchorage. Shore-to-ship delivery of this range and scope has never been explored, prior to this trial, Wilhelmsen said. 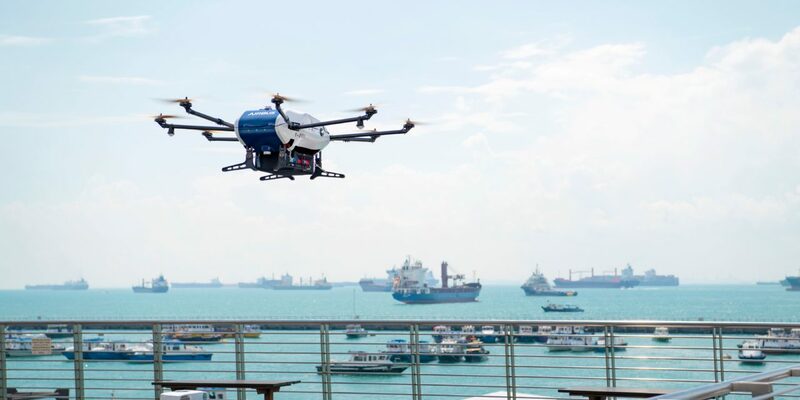 Lifting off from Marina South Pier in Singapore with 3D printed consumables from Wilhelmsen’s onshore 3D printing micro-factory, the Airbus Skyways drone navigated autonomously along pre-determined ‘aerial-corridors’ in its 1.5km flight to Eastern Working Anchorage. The drone landed on the deck of the Swire Pacific Offshore (SPO)’s Anchor Handling Tug Supply (AHTS) vessel, M/V Pacific Centurion and deposited its 1.5kg cargo without a hitch before returning to its base. The entire delivery, from take-off towards the vessel, to landing back at base, took just ten minutes. Operations began with a Toolbox Talk with the Wilhelmsen, Airbus and SPO crew to ensure that the risk assessment was understood by all parties. With final safety checks completed, Wilhelmsen’s Marina South Pier team loaded the drone. Supported by spotters stationed on board the vessel deck to ensure the safety of the crew and vessel, the drone took off towards the vessel, landing on the dedicated area on the main deck where the parcel was retrieved by the officer on board. Less labour dependent than delivery via launch, autonomous Unmanned Aerial Vehicles (UAVs) can potentially reduce delivery costs by up to 90% in some ports and have a smaller carbon footprint than launch boats. SPO has been an important partner during the detailed final preparation and operational testing of the drone, with the provision of its Anchor Handling Tug Supply. ...says Duncan Telfer, Commercial Director, SPO. The ongoing pilot trial will for now, focus on offshore supply vessels at anchorage 1.5km from the pier. For safety reasons, flights will be limited to this distance for the time being, before the flight range is gradually extended to as far as 3km from the shore. MPA Singapore is facilitating the trial, which started in late November 2018, through the interim use of Marina South Pier as the launching and landing point for Airbus’ delivery drone. At the same time, MPA has designated anchorages for vessels to anchor off Marina South for the trial. The Civil Aviation Authority of Singapore is also working with Wilhelmsen and Airbus to ensure safety of the trials.